This article is about video game competitions. For simulated sports in video games, see sports game. For multiplayer games in general, see multiplayer video game. Esports (also known as electronic sports, e-sports, or eSports) is a form of competition using video games. Most commonly, esports takes the form of organized, multiplayer video game competitions, particularly between professional players, individually or as teams. 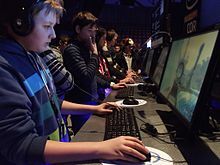 Although organized online and offline competitions have long been a part of video game culture, these were largely between amateurs until the late 2000s, when participation by professional gamers and spectatorship in these events through live streaming saw a large surge in popularity. By the 2010s, esports was a significant factor in the video game industry, with many game developers actively designing toward a professional esports subculture. The most common video game genres associated with esports are multiplayer online battle arena (MOBA), first-person shooter (FPS), fighting, digital collectible card games, battle royale games and real-time strategy (RTS). Popular esports titles include MOBA games such as, League of Legends, Dota 2 and Smite, FPS titles such as Counter-Strike and Call of Duty, CrossFire and Rainbow Six Siege which are in the FPS sub-genre of tactical shooters , Overwatch which is in the FPS sub-genre of hero shooter , fighting games such as Street Fighter, Super Smash Bros., Mortal Kombat and Soulcalibur, Beat 'em up such as Dungeon Fighter Online, digital collectible card games such as Hearthstone, Battle royale games such as PlayerUnknown's Battlegrounds and Fortnite Battle Royale, and RTS titles StarCraft. Tournaments such as the League of Legends World Championship, Dota 2's The International, the fighting games-specific Evolution Championship Series (EVO), and the Intel Extreme Masters provide live broadcasts of the competition and prize money to competitors. Many competitions use a series of promotion and relegation play with sponsored teams, such as the League of Legends World Championship, but more recently, competitions structured similar to American professional sports, with salaried players and regular season and play-off series, have emerged, such as the Overwatch League. The legitimacy of esports as a sports competition remains in question; however, esports has been featured alongside traditional sports in multinational events, and the International Olympic Committee has explored incorporating them into future Olympic events. By 2019, it is estimated that 427 million people worldwide will be watching some form of esports. The increasing availability of online streaming media platforms, particularly Panda.tv, YouTube, and Twitch have become central to the growth and promotion of esports competitions. Demographically, Major League Gaming has reported viewership that is approximately 85% male and 15% female, with a majority of viewers between the ages of 18 and 34. Despite this, several female personalities within esports are hopeful about the increasing presence of female gamers. South Korea has several established esports organizations, which have licensed pro gamers since the year 2000. Recognition of esports competitions outside of South Korea has come somewhat slower. Along with South Korea, most competitions take place in Europe, North America and China. Despite its large video game market, esports in Japan is relatively underdeveloped, and this has been attributed largely to its broad anti-gambling laws which prohibit paid professional gaming tournaments. The global esports market generated US$325 million of revenue in 2015 and was expected to make $493 million in 2016. The global esports audience in 2015 was 226 million people. According to a Newzoo report in April 2017, 42% of the gaming market belongs to the mobile industry, and mobile is projected to claim more than 50% the market by 2020. The esports industry is expanding beyond PC and console, as developer Super Evil Megacorp created Vainglory, the first mobile multiplayer online battle arena game, and companies like Skillz bring esports tournaments to mobile games. The earliest known video game competition took place on 19 October 1972 at Stanford University for the game Spacewar. Stanford students were invited to an "Intergalactic spacewar olympics" whose grand prize was a year's subscription for Rolling Stone, with Bruce Baumgart winning the five-man-free-for-all tournament and Tovar and Robert E. Maas winning the Team Competition. The Space Invaders Championship held by Atari in 1980 was the earliest large scale video game competition, attracting more than 10,000 participants across the United States, establishing competitive gaming as a mainstream hobby. In the summer of 1980, Walter Day founded a high score record keeping organization called Twin Galaxies. The organization went on to help promote video games and publicize its records through publications such as the Guinness Book of World Records, and in 1983 it created the U.S. National Video Game Team. The team was involved in competitions, such as running the Video Game Masters Tournament for Guinness World Records and sponsoring the North American Video Game Challenge tournament. During the 1970s and 1980s, video game players and tournaments began being featured in well-circulated newspapers and popular magazines including Life and Time. One of the most well known classic arcade game players is Billy Mitchell, who was credited with the records for high scores in six games including Pac-Man and Donkey Kong in the 1985 issue of the Guinness Book of World Records. Some of those records would be removed in 2018 amid allegations of fraud. Televised esports events aired during this period included the American show Starcade which ran between 1982 and 1984 airing a total of 133 episodes, on which contestants would attempt to beat each other's high scores on an arcade game. A video game tournament was included as part of TV show That's Incredible!, and tournaments were also featured as part of the plot of various films, including 1982's Tron. In the UK, the BBC game show First Class included competitive video game rounds featuring the contemporary arcade games Hyper Sports, 720° and Paperboy. The 1988 game Netrek was an Internet game for up to 16 players, written almost entirely in cross-platform open source software. Netrek was the third Internet game, the first Internet game to use metaservers to locate open game servers, and the first to have persistent user information. In 1993 it was credited by Wired Magazine as "the first online sports game". The fighting game Street Fighter II (1991) popularized the concept of direct, tournament-level competition between two players. Previously, video games most often relied on high scores to determine the best player, but this changed with Street Fighter II, where players would instead challenge each other directly, "face-to-face," to determine the best player, paving the way for the competitive multiplayer and deathmatch modes found in modern action games. The popularity of fighting games such as Street Fighter and Marvel vs. Capcom in the 1990s led to the foundation of the international Evolution Championship Series (EVO) esports tournament in 1996. Large esports tournaments in the 1990s include the 1990 Nintendo World Championships, which toured across the United States, and held its finals at Universal Studios Hollywood in California. Nintendo held a 2nd World Championships in 1994 for the Super Nintendo Entertainment System called the Nintendo PowerFest '94. There were 132 finalists that played in the finals in San Diego, California. Mike Iarossi took home 1st prize. Blockbuster Video also ran their own World Game Championships in the early 1990s, co-hosted by GamePro magazine. Citizens from the United States, Canada, the United Kingdom, Australia, and Chile were eligible to compete. Games from the 1994 championships included NBA Jam and Virtua Racing. Television shows featuring esports during this period included the British shows GamesMaster and Bad Influence! the Australian game show A*mazing, where in one round contestants competed in a video game face off, and the Canadian game show Video & Arcade Top 10. In the 1990s, many games benefited from increasing internet connectivity, especially PC games. Tournaments established in the late 1990s include the Cyberathlete Professional League (CPL), QuakeCon, and the Professional Gamers League. PC games played at the CPL included the Counter-Strike series, Quake series, and Warcraft. The growth of esports in South Korea is thought to have been influenced by the mass building of broadband internet networks following the 1997 Asian financial crisis. It is also thought that the high unemployment rate at the time caused many people to look for things to do while out of work. Instrumental to this growth of esports in South Korea was the prevalence of the Komany-style internet café/LAN gaming center, known as a PC bang. The Korean e-Sports Association, an arm of the Ministry of Culture, Sports and Tourism, was founded in 2000 to promote and regulate esports in the country. During the 2010s, esports grew tremendously, incurring a large increase in both viewership and prize money. Although large tournaments were founded before the 21st century, the number and scope of tournaments has increased significantly, going from about 10 tournaments in 2000 to about 260 in 2010. Many successful tournaments were founded during this period, including the World Cyber Games, the Intel Extreme Masters, and Major League Gaming. The proliferation of tournaments included experimentation with competitions outside traditional esports genres. For example, the September 2006 FUN Technologies Worldwide Webgames Championship featured 71 contestants competing in casual games for a $1 million grand prize. In April 2006 the G7 teams federation were formed by seven prominent Counter-Strike teams. The goal of the organization was to increase stability in the esports world, particularly in standardizing player transfers and working with leagues and organizations. The founding members were 4Kings, Fnatic, Made in Brazil, Mousesports, NiP, SK-Gaming, Team 3D. The organization only lasted until 2009 before dissolving. The 2000s was a popular time for televised esports. Television coverage was best established in South Korea, with StarCraft and Warcraft III competitions regularly televised by dedicated 24-hour cable TV game channels Ongamenet and MBCGame. Elsewhere, esports television coverage was sporadic. The German GIGA Television covered esports until its shutdown in 2009. The United Kingdom satellite television channel XLEAGUE.TV broadcast esports competitions from 2007 to 2009. The online esports only channel ESL TV briefly attempted a paid television model renamed GIGA II from June 2006 to autumn 2007. The French channel Game One broadcast esports matches in a show called Arena Online for the Xfire Trophy. The United States channel ESPN hosted Madden NFL competitions in a show called Madden Nation from 2005 to 2008. DirecTV broadcast the Championship Gaming Series tournament for two seasons in 2007 and 2008. CBS aired prerecorded footage of the 2007 World Series of Video Games tournament that was held in Louisville, Kentucky. The G4 television channel originally covered video games exclusively, but broadened its scope to cover technology and men's lifestyle, though has now shutdown. The popularity and emergence of online streaming services have helped the growth of esports in this period, and are the most common method of watching tournaments. Twitch, an online streaming platform launched in 2011, routinely streams popular esports competitions. 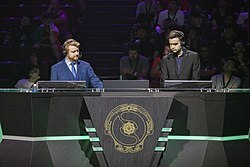 In 2013, viewers of the platform watched 12 billion minutes of video on the service, with the two most popular Twitch broadcasters being League of Legends and Dota 2. During one day of The International, Twitch recorded 4.5 million unique views, with each viewer watching for an average of two hours. The modern esports boom has also seen a rise in video games companies embracing the esports potential of their products. After many years of ignoring and at times suppressing the esports scene, Nintendo hosted Wii Games Summer 2010. Spanning over a month, the tournament had over 400,000 participants, making it the largest and most expansive tournament in the company's history. In 2014 Nintendo hosted an invitational Super Smash Bros. for Wii U competitive tournament at the 2014 Electronic Entertainment Expo (E3) press conference that was streamed online on Twitch. Halo developers 343 Industries announced in 2014 plans to revive Halo as an esport with the creation of the Halo Championship Series and a prize pool of $50,000 USD. Both Blizzard Entertainment and Riot Games have their own collegiate outreach programs with their North American Collegiate Championship. Since 2013 universities and colleges in the United States such as Robert Morris University Illinois and the University of Pikeville have recognized esports players as varsity level athletes and offer athletic scholarships. In 2017, Tespa, Blizzard Entertainment's collegiate esports division, unveiled its new initiative to provide scholarships and prizes for collegiate esports clubs competing in its tournaments worth US$1 million. Colleges have began granting scholarships to students who qualify to play esports professionally for the school. Colleges such as Columbia College, Robert Morris University, and Indiana Institute of Technology have taken part in this. In 2018, Harrisburg University of Science and Technology began a tuition scholarship program for esports players. In 2014, the largest independent esports league, Electronic Sports League, partnered with the local brand Japan Competitive Gaming to try and grow esports in the country. Physical viewership of esports competitions and the scope of events have increased in tandem with the growth of online viewership. In 2013, the Season 3 League of Legends World Championship was held in a sold-out Staples Center. The 2014 League of Legends World Championship in Seoul, South Korea, had over 40,000 fans in attendance and featured the band Imagine Dragons, and opening and closing ceremonies in addition to the competition. In 2015, the first Esports Arena was launched in Santa Ana, California, as the United States' first dedicated esports facility. In 2018, the Luxor Las Vegas will open the first esports Arena on the Las Vegas Strip and additional locations are planned to open in the coming decade. In most esports, organized play is centered around the use of promotion and relegation to move sponsored teams between leagues within the competition's organization based on how the team fared in matches; this follows patterns of professional sports in European and Asian countries. However, with rising interest in viewership of esports, some companies sought to create leagues that followed the approach used in North American professional sports, in which all teams participate in a regular season of matches to vie for top standing as to participate in the post-season games. This approach is more attractive for larger investors, who would be more willing to back a team that remains playing in the esport's premiere league and not threatened to be relegated to a lower standing. Blizzard Entertainment announced the Overwatch League, based on its Overwatch game, in 2016, with its inaugural regular season featuring twelve teams starting in January 2018. Players that get contracts to play on teams are guaranteed an annual salary and benefits, as well as sharing of the team's revenue and prize winnings; the first season had a total prize pool of US$3.5 million available, with US$1 million to the team winning in post-season. Take-Two Interactive partnered with the National Basketball Association (NBA) to create the NBA 2K League, using the NBA 2K game series. It is the first esports league to be operated by a professional sports league, and the NBA sought to have a League team partially sponsored by each of the 30 professional NBA teams. Its inaugural season is set to start May 2018 with 17 teams. Similarly, EA Sports and Major League Soccer (MLS) established the eMLS, a league using EA's FIFA 18; in its inaugural season, 19 of the 23 MLS teams will manage teams for the eMLS. Labeling video games as sports is a controversial point of debate. While some point to the growth in popularity of esports as justification for designating some games as sports, others contend that video games will never reach the status of "true sports". However popularity is not the only reason identified: some have argued that "careful planning, precise timing, and skillful execution" ought to be what classifies an activity as sport, and that physical exertion and outdoor playing areas are not required by all traditional or non-traditional "sports". In a 2014 technology conference, when asked about the recent buyout of popular game streaming service Twitch, ESPN president John Skipper described esports as "not a sport – [they're] a competition." In 2013 on an episode of Real Sports with Bryant Gumbel the panelist openly laughed at the topic. In addition, many in the fighting games community maintain a distinction between their competitive gaming competitions and the more commercially connected esports competitions of other genres. Video games are sometimes classified as a mind sport. In the 2015 World Championship hosted by the International Esports Federation, an esports panel was hosted with guests from international sports society to discuss the future recognition of esports as a recognized, legitimate sporting activity worldwide. In 2013, Canadian League of Legends player Danny "Shiphtur" Le became the first pro gamer to receive an American P-1A visa, a category designated for "Internationally Recognized Athletes". In 2014, Turkey's Ministry of Youth and Sports started issuing e-Sports Player licenses to players certified as professionals. In 2016, the French government started working on a project to regulate and recognize esports. The Games and Amusements Board of the Philippines started issuing athletic license to Filipino esports players who are vouched by a professional esports team in July 2017. To help promote esports as a legitimate sport, several esports events have been run alongside more traditional international sport competitions. The 2007 Asian Indoor Games was the first notable multi-sport competition including esports as an official medal-winning event alongside other traditional sports, and the later editions of the Asian Indoor Games and its successor the Asian Indoor and Martial Arts Games have always included esports as an official medal event or an exhibition event up to now. Moreover, the Asian Games, which is the Asian top-level multi-sport competition, will also include esports as a medal event at the 2022 edition; esports around games such as Hearthstone, Starcraft II, and League of Legends were presented as an exhibition event at the 2018 Asian Games as a lead-in to the 2022 games. The 2019 Southeast Asian Games will include six medal events for esports. The Olympic Games are also seen as a potential method to legitimize esports. A summit held by the International Olympic Committee (IOC) in October 2017 acknowledged the growing popularity of esports, concluding that "Competitive 'esports' could be considered as a sporting activity, and the players involved prepare and train with an intensity which may be comparable to athletes in traditional sports" but would require any games used for the Olympics fitting "with the rules and regulations of the Olympic movement". Two difficulties remain for presenting esports as an Olympic event according to IOC President Thomas Bach: that they would need to restrict those that present violent gameplay, and that there is currently a lack of a global sanctioning body for esports to coordinate further. On the issue of violence, while Bach acknowledged that many Olympic sports bore out from actual violent combat, "sport is the civilized expression about this. If you have egames where it’s about killing somebody, this cannot be brought into line with our Olympic values." Due to that, it was suggested that the IOC would approve more of esports centered around games that simulate real sports, such as the NBA 2K or FIFA series. The issues around esports have not prevented the IOC from exploring what possibilities there are for incorporation into future Olympics. During July 2018, the IOC and the Global Association of International Sports Federations (GAISF) held a symposium and inviting major figures in esports, including Epic Games' Mark Rein, Blizzard Entertainment's Mike Morhaime, and esports players Dario "TLO" Wünsch, Jacob "Jake" Lyon, and Se-yeon "Geguri" Kim, for these organizations "to gain a deeper understanding of esports, their impact and likely future development, so that [they] can jointly consider the ways in which [they] may collaborate to the mutual benefit of all of sport in the years ahead". The IOC has tested the potential for esports through exhibition games. With support of the IOC, Intel sponsored exhibition esport events for StarCraft II and Steep prior to the 2018 Winter Olympics in Pyeongchang, and five South Korean esport players were part of the Olympic Torch relay. A similar exhibition showcase, the eGames, was held alongside the 2016 Summer Olympics in Rio de Janeiro, though this was not supported by the IOC. Leaders in Japan are becoming involved to help bring esports to the 2020 Summer Olympics and beyond, given the country's reputation as a major video game industry center. Esports in Japan had not flourished due to the country's anti-gambling laws that also prevent paid professional gaming tournaments, but there were efforts starting in late 2017 to eliminate this issue. At the suggestion of the Tokyo Olympic Games Committee for the 2020 Summer Olympics, four esports organizations have worked with Japan's leading consumer organization to exempt esports tournaments from gambling law restrictions. Takeo Kawamura, a member of the Japanese House of Representatives and of the ruling Liberal Democratic Party, led a collation of ruling and opposing politicians to support esports, called the Japan esports Union, or JeSU; Kawamura said that they would be willing to pass laws to further exempt esports as needed so that esports athletes can make a living playing these sports. So far, this has resulted in the ability of esports players to obtain exemption licenses to allow them to play, a similar mechanism needed for professional athletes in other sports in Japan to play professionally. The first such licenses were given out in mid-July 2018, via a tournament held by several video game publishers to award prizes to many players but with JeSU offered these exemption licenses to the top dozen or so players that emerge, allowing them to compete in further esports events. The Tokyo Olympic Committee has also planned to arrange a number of esports events to lead up into the 2020 games. The organization committee for the 2024 Summer Olympics in Paris were in discussions with the IOC and the various professional esport organizations to consider esports for the event, citing the need to include these elements to keep the Olympics relevant to younger generations. Ultimately, the orgnization committee determined esports were premature to bring to the 2024 Games as medal events, but have not ruled out other activities related to esports during the Games. A number of games are popular among professional competitors. The tournaments which emerged in the mid-1990s coincided with the popularity of fighting games and first-person shooters, genres which still maintain a devoted fan base. In the 2000s, real-time strategy games became overwhelmingly popular in South Korean internet cafés, with crucial influence on the development of esports worldwide. Competitions exist for many titles and genres, though the most popular games as of the late 2010s are Counter-Strike: Global Offensive, Call of Duty, League of Legends, Dota 2, Smite, Rocket League, Heroes of the Storm, Hearthstone, Super Smash Bros. Melee, StarCraft II and Overwatch. Hearthstone has also popularized the digital collectible card game (DCCG) genre since its release in 2014. While it is common for video games to be designed with the experience of the player in game being the only priority, many successful esports games have been designed to be played professionally from the beginning. Developers may decide to add dedicated esports features, or even make design compromises to support high level competition. Games such as StarCraft II, League of Legends, and Dota 2 have all been designed, at least in part, to support professional competition. In addition to allowing players to participate in a given game, many game developers have added dedicated observing features for the benefit of spectators. This can range from simply allowing players to watch the game unfold from the competing player's point of view, to a highly modified interface that gives spectators access to information even the players may not have. The state of the game viewed through this mode may tend to be delayed by a certain amount of time in order to prevent either teams in a game from gaining a competitive advantage. Games with these features include Counter-Strike: Global Offensive, Call of Duty, StarCraft II, Dota 2, and Counter-Strike. League of Legends includes spectator features, which are restricted to custom game modes. In response to the release of virtual reality headsets in 2016, some games, such as Dota 2, were updated to include virtual reality spectating support. A very common method for connection is the Internet. Game servers are often separated by region, but high quality connections allow players to set up real-time connections across the world. Downsides to online connections include increased difficulty detecting cheating compared to physical events, and greater network latency, which can negatively impact players' performance, especially at high levels of competition. Many competitions take place online, especially for smaller tournaments and exhibition games. Since the 1990s, professional teams or organized clans have set up matches via Internet Relay Chat networks such as QuakeNet. As esports have developed, it has also become common for players to use automated matchmaking clients built into the games themselves. This was popularized by the 1996 release of Blizzard's Battle.net, which has been integrated into both the Warcraft and StarCraft series. Automated matchmaking has become commonplace in console gaming as well, with services such as Xbox Live and the PlayStation Network. After competitors have contacted each other, the game is often managed by a game server, either remotely to each of the competitors, or running on one of the competitor's machines. Additionally, competitions are also often conducted over a local area network or LAN. The smaller network usually has very little lag and higher quality. Because competitors must be physically present, LANs help ensure fair play by allowing direct scrutiny of competitors. This helps prevent many forms of cheating, such as unauthorized hardware or software modding. The physical presence of competitors helps create a more social atmosphere at LAN events. Many gamers organize LAN parties or visit Internet cafés, and most major tournaments are conducted over LANs. Individual games have taken various approaches to LAN support. In contrast to the original StarCraft, StarCraft II was released without support for LAN play, drawing some strongly negative reactions from players. League of Legends was originally released for online play only, but announced in October 2012 that a LAN client was in the works for use in major tournaments. In September 2013, Valve added general support for LAN play to Dota 2 in a patch for the game. Esports tournaments are almost always physical events in which occur in front of a live audience. The tournament may be part of a larger gathering, such as Dreamhack, or the competition may be the entirety of the event, like the World Cyber Games. Competitions take several formats, but the most common are single or double elimination, sometimes hybridized with group stage. Competitions usually have referees or officials to monitor for cheating. Although competitions involving video games have long existed, esports underwent a significant transition in the late 1990s. Beginning with the Cyberathlete Professional League in 1997, tournaments became much larger, and corporate sponsorship became more common. Increasing viewership both in person and online brought esports to a wider audience. Major tournaments include the World Cyber Games, the North American Major League Gaming league, the France-based Electronic Sports World Cup, and the World e-Sports Games held in Hangzhou, China. For well established games, total prize money can amount to millions of U.S. dollars a year. As of 10 September 2016, Dota 2 has awarded approximately US$86 million in prize money within 632 registered tournaments, with 23 players winning over $1 million. League of Legends awarded approximately $30 million within 1749 registered tournaments, but in addition to the prize money, Riot Games provides salaries for players within their League of Legends Championship Series. Nonetheless, there has been criticism to how these salaries are distributed, since most players earn a fairly low wage but a few top players have a significantly higher salary, skewing the average earning per player. In August 2018, The International 2018, Valve's annual premier Dota 2 tournament, was held and broke the record for holding the largest prize pool to date for any esports tournament, amounting to over US$25 million. Often, game developers provide prize money for tournament competition directly, but sponsorship may also come from third parties, typically companies selling computer hardware, energy drinks, or computer software. Generally, hosting a large esports event is not profitable as a stand-alone venture. For example, Riot has stated that their headline League of Legends Championship Series is "a significant investment that we're not making money from". There is considerable variation and negotiation over the relationship between video game developers and tournament organizers and broadcasters. While the original StarCraft events emerged in South Korea largely independently of Blizzard, the company decided to require organizers and broadcasters to authorize events featuring the sequel StarCraft II. In the short term, this led to a deadlock with the Korean e-Sports Association. An agreement was reached in 2012. Blizzard requires authorization for tournaments with more than $10,000 USD in prizes. Riot Games offers in-game rewards to authorized tournaments. Esport competitions have also become a popular feature at gaming and multi-genre conventions. The training that the players must undergo to prepare for tournaments is different but still takes a tremendous amount of time. Athletes from traditional sports' training is almost entirely based on honing their physical prowess in performing that sport, such as muscle memory, exercising, and dieting. Esports athletes' training is much more based on training the mind, such as studying strategies and new updates for the game. Team Liquid, a professional League of Legends team, practice for a minimum of 50 hours per week and most play the game far more. This training schedule for players has resulted in many of them retiring an early age. Few careers burn as intensely—and as briefly—as that of an esports professional. Players are generally in competition by their mid- to late teens, and most are retired by their mid-20s. Some esports teams, such as compLexity, have been following traditional sports training such as regular gym visits, sessions with a coach, and following a special diet. Professional gamers, or "pro gamers", are often associated with gaming teams and/or broader gaming associations. Teams like FaZe Clan, OpTic Gaming, Evil Geniuses, Team SoloMid, Cloud9, Fnatic, Mineski, Counter Logic Gaming, SK Telecom T1, Splyce, Team EnVyUs, and Natus Vincere consist of several professionals. In addition to prize money from tournament wins, players may also be paid a separate team salary. Team sponsorship may cover tournament travel expenses or gaming hardware. Prominent esports sponsors include companies such as Logitech and Razer. Teams feature these sponsors on their website, team jerseys and on their social media, in 2016 the biggest teams have social media followings of over a million. Associations include the Korean e-Sports Association (KeSPA), the International e-Sports Federation (IeSF), the British esports Association, and the World esports Association (WESA). Some traditional sporting athletes have invested in esports, such as Rick Fox's ownership of Echo Fox, Jeremy Lin's ownership of Team VGJ, Shaquille O'Neal's investment in NRG Esports. Some association football teams, such as FC Schalke 04 in Germany, Paris Saint-Germain esports in France; Besiktas JK, Fenerbahce S.K., and Galatasaray in Turkey; Panathinaikos F.C. in Greece either sponsor or have complete ownership in esports teams. Pro gamers are usually obligated to behave ethically, abiding by both the explicit rules set out by tournaments, associations, and teams, as well as following general expectations of good sportsmanship. For example, it is common practice and considered good etiquette to chat "gg" (for "good game") when defeated. Many games rely on the fact competitors have limited information about the game state. In a prominent example of good conduct, during a 2012 IEM StarCraft II game, the players Feast and DeMusliM both voluntarily offered information about their strategies to negate the influence of outside information inadvertently leaked to "Feast" during the game. Players in some leagues have been reprimanded for failure to comply with expectations of good behavior. In 2012 professional League of Legends player Christian "IWillDominate" Riviera was banned from competing for a period of one year following a history of verbal abuse. In 2013 StarCraft II progamer Greg "Idra" Fields was fired from Evil Geniuses for insulting his fans on the Team Liquid internet forums. League of Legends players Mithy and Nukeduck received similar penalties in 2014 after behaving in a "toxic" manner during matches. Team Siren, an all-female League of Legends team, was formed in June 2013. The announcement of the team was met with controversy, being dismissed as a "gimmick" to attract the attention of men. The team disbanded within a month, due to the negative publicity of their promotional video, as well as the poor attitude of the team captain towards her teammates. There have been serious violations of the rules. In 2010, eleven StarCraft: Brood War players were found guilty of fixing matches for profit, and were fined and banned from future competition. Team Curse and Team Dignitas were denied prize money for collusion during the 2012 MLG Summer Championship. In 2012, League of Legends team Azubu Frost was fined US$30,000 for cheating during a semifinal match of the world playoffs. Dota 2 player Aleksey "Solo" Berezin was suspended from a number of tournaments for intentionally throwing a game in order to collect $322 from online gambling. In 2014, four high-profile North American Counter-Strike players from iBuyPower, namely Sam "DaZeD" Marine, Braxton "swag" Pierce, Joshua "steel" Nissan and Keven "AZK" Lariviere were suspended from official tournaments after they had been found guilty of match-fixing. The four players had allegedly profited over US$10,000 through betting on their fixed matches. Gambling on esports using Counter-Strike: Global Offense "skins", worth an estimated US$2.3 billion in 2015, had come under criticism in June and July 2016 after several questionable legal and ethical aspects of the practice were discovered. Reports of widespread use of performance-enhancing drugs (PEDs) in esports are not uncommon, with players discussing their own, their teammates' and their competitors' use and officials acknowledging the prevalence of the issue. Players often turn to stimulants such as Ritalin, Adderall and Vyvanse, drugs which can significantly boost concentration, improve reaction time and prevent fatigue. Selegiline, a drug used to treat Parkinson's disease, is reportedly popular because, like stimulants, it enhances mood and motivation. Conversely, drugs with calming effects are also sought after. Some players take propanolol, which blocks the effects of adrenaline, or Valium, which is prescribed to treat anxiety disorder, in order to remain calm under pressure. According to Bjoern Franzen, a former SK Gaming executive, it is second nature for some League of Legends players to take as many as three different drugs before competition. In July 2015 Kory "Semphis" Friesen, an ex-Cloud9 player, admitted that he and his teammates were all using Adderall during a match against Virtus.pro in the ESL One Katowice 2015 Counter-Strike: Global Offensive tournament, and went on to claim that "everyone" at ESEA League tournaments uses Adderall. The unregulated use of such drugs poses severe risks to competitors' health, including addiction, overdose, serotonin syndrome and, in the case of stimulants, weight loss. Even over-the-counter energy drinks which are marketed specifically toward gamers have faced media and regulatory scrutiny due to deaths and hospitalizations. Accordingly, Adderall and other such stimulants are banned and their use penalized by many professional sporting bodies and leagues, including Major League Baseball and the National Football League. Although International e-Sports Federation (IeSF) is a signatory of the World Anti-Doping Agency, the governing body has not outlawed any PEDs in its sanctioned competitions. Action has been taken on the individual league level, however, as at least one major league, the Electronic Sports League, has made use of any drugs during matches punishable by expulsion from competition. Although not all players use drugs, it is common to see gamers use energy boosters or drinks. They commonly drink caffeinated drinks or use energy pills. There has been some concern over the quality of life and potential mistreatment of players by organizations, especially in South Korea. Korean organizations have been accused of refusing to pay competitive salaries, leading to a slow exodus of Korean players to other markets. In an interview, League of Legends player Bae "Dade" Eo-jin said that "Korean players wake up at 1pm and play until 5am", and suggested that the 16 hour play schedule was a significant factor in causing burnout. Concerns over the mental health of players intensified in 2014 when League of Legends player Cheon "Promise" Min-Ki attempted suicide a week after admitting to match fixing. To combat the negative environment, Korean League of Legends teams were given new rules for the upcoming 2015 season by Riot Games, including the adoption of minimum salaries for professional players, requiring contracts and allowing players to stream individually for additional player revenue. League of Legends Championship Series and League of Legends Champions Korea offer guaranteed salaries for players. Despite this, online streaming is preferred by some players, as it is in some cases more profitable than competing with a team and streamers have the ability to determine their own schedule. The International tournament awards US$10 million to the winners, however teams that do not have the same amount of success often do not have financial stability and frequently break up after failing to win. In 2015 it was estimated by SuperData Research that the global esports industry generated revenue of around US$748.8 million that year. Asia is the leading esports market with over $321 million in revenue, North America is around $224 million, and Europe has $172 million and the rest of the world for about $29 million. Global esports revenue is estimated to reach $1.9 billion by 2018. The number of female viewers has been growing in esports, with an estimated 30% of esports viewers being female in 2013, an increase from 15% from the previous year. However, despite the increase in female viewers, there is not a growth of female players in high level competitive esports. The top female players that are involved in esports mainly get exposure in female-only tournaments, most notably Counter-Strike, Dead or Alive 4, and StarCraft II. All-female esports teams include Frag Dolls and PMS Clan. Gambling and betting on esport matches have generally been illegal in major markets. The illegality of esport gambling has created a black market related to esports and virtual currency, as these go unregulated, may encourage match-fixing by players themselves, and lead to concerns about underage gambling due to the draw of video games. One such example of this is skin gambling, where virtual items earned in games were used as a currency for users to bet on the outcome of matches. Esports gambling in the United States has been illegal under the federal Professional and Amateur Sports Protection Act of 1992 (PASPA) until May 2018. The Act prevented all but five states from allowing gambling on sporting events. However, regulation of esports betting still depended on state law. Some betting houses in Nevada, where sports betting is already exempted under PASPA, classify esports as non-competitive "other events" similar to the selection of the Heisman Trophy winner or NFL Draft to be legal. Other companies established in the United States allow for legal esports betting for international users but are restricted from Americans. Nevada legalized esports gambling in June 2017, classifying esports alongside competitive sports and dog racing. With the Supreme Court of the United States's ruling in Murphy v. National Collegiate Athletic Association in May 2018, PASPA was found unconstitutional, as the Court ruled that the federal government cannot limit states from regulating sports betting. This created the potential for legalized esports-based betting in the United States. However, New Jersey, the state at the center of the Supreme Court case, passed its bill to legalize sports gambling but restricted gambling on esports to only international competitions where most players are over 18 years of age. Without PASPA, interstate gambling on esports would be still be limited by the Federal Wire Act, preventing users from betting on national esports events outside of the state. With the growing popularity of machine learning in data analytics, esports has been the focus of several software programs that analyze the plethora of game data available. Based on the huge number of matches played on a daily basis globally (League of Legends alone had a reported 100 million active monthly players worldwide in 2016 and an average of 27 million League of Legends games played per day reported in 2014 ), these games can be used for applying big-data machine learning platforms. Several games make their data publicly available, so websites aggregate the data into easy-to-visualize graphs and statistics. In addition, several programs use machine learning tools to predict the win probability of a match based on various factors, such as team composition. In 2018, the DotA team Team Liquid partnered with a software company to allow players and coaches to predict the team's success rate in each match and provide advice on what needs to be changed to improve performance. As more esport competitions and leagues are run entirely or in portion by the video game publisher or developer for the game, the ongoing viability of that game's esport activities is tied to that company. In December 2018, Blizzard announced that it was reducing resources spent on the development of Heroes of the Storm and canceling its plans for tournaments in 2019. This caused several professional Heroes players and coaches recognizing their career was no longer viable, and expressed outrage and disappointment at Blizzard's decision. 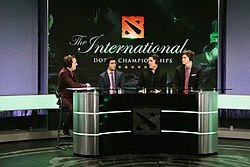 As with traditional sporting events, larger eSport events, such as The International, usually feature live pre- and post-game discussion by a panel of analysts (top), with in-match casting being done by play-by-play and color commentators (bottom). The main medium for esports coverage is the Internet. In the mid-2010s, mainstream sports and news reporting websites, such as ESPN, Yahoo!, Sport1, Kicker, and Aftonbladet started dedicated esports coverage. esports tournaments commonly use commentators or casters to provide live commentary of games in progress, similar to a traditional sports commentator. For popular casters, providing commentary for esports can be a full-time position by itself. Prominent casters for StarCraft II include Dan "Artosis" Stemkoski and Nick "Tasteless" Plott. In 2018, the Associated Press' AP Stylebook officially began spelling the word as "esports", dropping support for both the capital "S" and the dash between "e" and "sports" styles, similar to how "e-mail" transformed with common usage to "email". Richard Tyler Blevins, better known as "Ninja", became the first professional gamer to appear in a cover story for a major sports magazine when he appeared in the September 2018 issue of ESPN The Magazine. Many esports events are streamed online to viewers over the internet. With the shutdown of the Own3d streaming service in 2013, Twitch is by far the most popular streaming service for esports, competing against other providers such as Hitbox.tv, Azubu, and YouTube Gaming. Dreamhack Winter 2011 reached 1.7 million unique viewers on Twitch. While coverage of live events usually brings in the largest viewership counts, the recent popularization of streaming services has allowed individuals to broadcast their own gameplay independent of such events as well. Individual broadcasters can enter an agreement with Twitch or Hitbox in which they receive a portion of the advertisement revenue from commercials which run on the stream they create. Another major streaming platform was Major League Gaming's MLG.tv. The network, which specializes in Call of Duty content but hosts a range of gaming titles, has seen increasing popularity, with 1376% growth in MLG.tv viewership in Q1 of 2014. The 2014 Call of Duty: Ghosts broadcast at MLG's X Games event drew over 160,000 unique viewers. The network, like Twitch, allows users to broadcast themselves playing games, though only select individuals can use the service. For several years, MLG.tv was the primary streaming platform for the Call of Duty professional scene; famous players such as NaDeSHoT and Scump have signed contracts with the company to use its streaming service exclusively. In January 2016, MLG was acquired by Activision Blizzard. YouTube also relaunched its livestreaming platform with a renewed focus on live gaming and esports specifically. For The International 2014, coverage was also simulcast on ESPN's streaming service ESPN3. In December 2016, Riot Games announced a deal with MLB Advanced Media's technology division BAM Tech for the company to distribute and monetize broadcasts of League of Legends events through 2023. BAM Tech will pay Riot at least $300 million per-year, and split advertising revenue. Especially since the popularization of streaming in esports, organizations no longer prioritize television coverage, preferring online streaming websites such as Twitch. Ongamenet continues to broadcast as an esports channel in South Korea, but MBCGame was taken off the air in 2012. Riot Games' Dustin Beck stated that "TV's not a priority or a goal", and DreamHack's Tomas Hermansson said "esports have [been proven] to be successful on internet streaming [services]." On the night before the finals of The International 2014 in August, ESPN3 broadcast a half-hour special profiling the tournament. In 2015, ESPN2 broadcast Heroes of the Dorm, the grand finals of the Heroes of the Storm collegiate tournament. The first-place team from the University of California, Berkeley received tuition for each of the teams players, paid for by Blizzard and Tespa. The top four teams won gaming equipment and new computers. This was the first time an eSport had ever been broadcast on a major American television network. 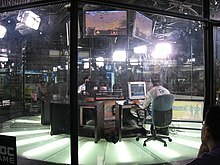 The broadcast was an attempt to broaden the appeal of esports by reaching viewers who would not normally come across it. However, the broadcast was met with a few complaints. Those living outside of the United States were unable to view the tournament. Additionally, the tournament could not be viewed online via streams, cutting off a large portion of viewers from the main demographic in the process. In September 2015, Turner Broadcasting partnered with WME/IMG. In December 2015, the partnered companies announced two seasons of the ELeague, a Counter-Strike: Global Offensive league based in North America including 15 teams from across the world competing for a $1,200,000 prize pool each 10-week season. The tournament, filmed at Turner's studios in Atlanta, Georgia, is simultaneously streamed on online streaming websites and TBS on Friday nights. In January 2016, Activision Blizzard, publishers of the Call of Duty and StarCraft series, acquired Major League Gaming. In an interview with The New York Times about the purchase, Activision Blizzard CEO Robert Kotick explained that the company was aspiring to create a U.S. cable network devoted to esports, which he described as "the ESPN of video games". He felt that higher quality productions, more in line with those of traditional sports telecasts, could help to broaden the appeal of esports to advertisers. Activision Blizzard had hired former ESPN and NFL Network executive Steve Bornstein to be CEO of the company's esports division. TV 2, the largest private television broadcaster in Norway, broadcasts esports across the country. TV 2 partnered with local Norwegian organization House of Nerds to bring a full season of esports competition with an initial lineup of Counter-Strike: Global Offensive, League of Legends, and StarCraft II. In April 2016, Big Ten Network announced a collaboration with Riot to hold an invitational League of Legends competition between two universities from the collegiate Big Ten Conference, as part of Riot's collegiate championships at PAX East. On 17 January 2017, Big Ten Network and Riot announced that it would hold a larger season of conference competition involving 10 Big Ten schools. Nielsen Holdings, a global information company known for tracking viewership for television and other media, announced in August 2017 that it would launch Nielsen esports, a division devoted to providing similar viewership and other consumer research data around esports, forming an advisory board with members from ESL, Activision Blizzard, Twitch.tv, YouTube, ESPN, and FIFA to help determine how to track and monitor audience sizes for eSport events. In July 2018, on the first day of the inaugural 2018 Overwatch League season playoffs, Blizzard and Disney announced a multi-year deal that gave Disney and its networks ESPN and ABC broadcast rights to the Overwatch League and Overwatch World Cup, starting with the playoffs and continuing with future events. ^ Hamari, Juho; Sjöblom, Max (2016). "What is eSports and why do people watch it?". Internet Research. doi:10.1108/IntR-04-2016-0085. SSRN 2686182. ^ a b Paul Tassi (20 December 2012). "2012: The Year of eSports". Forbes. Retrieved 15 August 2013. ^ a b c d Ben Popper (30 September 2013). "Field of Streams: How Twitch Made Video Games a Spectator Sport". The Verge. Retrieved 9 October 2013. ^ "427 million people will be watching esports by 2019, reports Newzoo". ESPN.com. ^ "Major League Gaming reports COWS GO MOO 334 percent growth in live video". GameSpot. 14 November 2012. Retrieved 8 October 2013. ^ John Gaudiosi (28 April 2012). "Team Evil Geniuses Manager Anna Prosser Believes More Female Gamers Will Turn Pro". Forbes. Retrieved 8 October 2013. ^ John Gaudiosi (29 July 2012). "Taipei Assassins Manager Erica Tseng Talks Growth Of Female Gamers In League Of Legends". Forbes. Retrieved 8 October 2013. ^ Andrew Groen (14 May 2013). "Why gamers in Asia are the world's best eSport athletes". PC World. Retrieved 7 October 2013. ^ a b c d Yuji Nakamura; Emi Nobuhiro; Takako Taniguchi (18 January 2018). "Shinzo Abe's Party Wants Japan Ready for Video Games in Olympics". Bloomberg Businessweek. Retrieved 19 January 2018. ^ "Global Esports Market Report: Audience & Revenue Figures". Newzoo. 23 August 2016. Retrieved 31 August 2016. ^ "The Global Games Market 2017 | Per Region & Segment | Newzoo". Newzoo. Retrieved 23 February 2018. ^ "Mobile Esports: Should We Believe the Hype?|Esports". GINX Esports TV. 10 August 2017. Retrieved 23 February 2018. ^ "Why mobile could be the next big thing for eSports". Fortune. Retrieved 23 February 2018. ^ Kolodny, Lora. "Skillz is the biggest e-sports company gamers have never heard of". TechCrunch. Retrieved 23 February 2018. ^ "The Rise of Esports". Racer Gaming Chairs. ^ Owen Good (19 October 2012). "Today is the 40th Anniversary of the World's First Known Video Gaming Tournament". Kotaku. Retrieved 1 August 2013. ^ "Players Guide To Electronic Science Fiction Games". Electronic Games. 1 (2): 35–45 . March 1982. Retrieved 1 February 2012. ^ Bramwell, Tom (8 March 2010). "Walter Day leaves Twin Galaxies". EuroGamer. Retrieved 18 September 2013. ^ Carless, Simon (20 October 2006). "World's Oldest Competitive Gamer Passes On". GameSetWatch. Retrieved 18 September 2013. ^ Caoili, Eric (4 May 2009). "Walter Day: Twin Galaxies and the Two Golden Domes". GameSetWatch. Retrieved 18 September 2013. ^ "Video champ tourney bound". Sunday Star-News. 23 December 1984. p. 6F. Retrieved 20 September 2013. ^ Michael Borowy (2012). "3". Public Gaming: eSport and Event Marketing in the Experience Economy (PDF) (Thesis). Retrieved 18 September 2013. ^ Ramsey, David. "The Perfect Man: How Billy Mitchell became a video-game superstar and achieved Pac-Man bliss". Oxford American. Archived from the original on 29 February 2008. ^ Crecente, Brian (April 13, 2018). "Guinness World Records Disqualifies Billy Mitchell's Perfect 'Pac-Man' Run, Other Achievements". Variety. Retrieved April 14, 2018. ^ Plunkett, Luke (14 June 2011). "Arcades Don't Make for Good TV (But Starcades do)". Kotaku. Retrieved 17 September 2013. ^ Biggs, John (29 July 2009). "The That's Incredible! Video Game Invitational: This is what we used to watch". Tech Crunch. Retrieved 30 September 2013. ^ Ebert, Roger (1 January 1982). "TRON". Retrieved 20 September 2013. ^ "First Class". TV Cream. Retrieved 14 June 2018. ^ Weaver, Iain. "Weaver's Week 2012-08-12: First Class". UK Gameshows.com. Labyrinth Games. Retrieved 14 June 2018. ^ Kevin Kelly (Dec 1993). "The First Online Sports Game". wired.com. Retrieved 1 July 2013. ^ a b Patterson, Eric L. (November 3, 2011). "EGM Feature: The 5 Most Influential Japanese Games Day Four: Street Fighter II". Electronic Gaming Monthly. Retrieved April 17, 2012. ^ Matt Barton; Bill Loguidice (2009). Vintage games: an insider look at the history of Grand Theft Auto, Super Mario, and the most influential games of all time. Boston: Focal Press/Elsevier. pp. 239–255. ISBN 0-240-81146-1. Retrieved April 17, 2012. ^ Mozur, Paul (19 October 2014). "For South Korea, E-Sports Is National Pastime". The New York Times. Retrieved 13 June 2015. ^ "History of Korea e-Sports Association 1999–2004" (in Korean). KeSPA. Retrieved 7 October 2013. ^ Patrick Miller (29 December 2010). "2011: The Year of eSports". PCWorld. Retrieved 15 August 2013. ^ Gaudiosi, John (12 February 2014). "'Ender's Game' Blu-ray gets ESports tournament". Chicago Tribune. Archived from the original on 26 February 2014. Retrieved 20 February 2014. ^ Tim Surette (11 September 2006). "Casual gamer gets serious prize". GameSpot. ^ G7 Federation (20 April 2006). "G7 teams launched". Fnatic. Retrieved 12 June 2015. ^ a b c Kim, Ryan (11 June 2007). "League beginning for video gamers". Sfgate.com. Retrieved 4 June 2012. ^ "ESL TV". Archived from the original on 4 May 2012. Retrieved 16 September 2013. ^ "Xfire Trophy CC3 @ Arena Online on Gameone TV". SK Gaming. ^ Schiesel, Seth (28 July 2007). "Video Game Matches to Be Televised on CBS". The New York Times. Retrieved 4 December 2013. ^ Patrick Howell O'Neill (16 January 2014). "Twitch dominated streaming in 2013, and here are the numbers to prove it". The Daily Dot. Retrieved 9 November 2014. ^ Alex R (29 April 2014). "Nintendo Announces Super Smash Bros. Invitational at E3 2014". eSports Max. Archived from the original on 9 November 2014. Retrieved 9 November 2014. ^ Jasmine Henry (7 September 2014). "Microsoft Launching 'Halo Championship Series' eSports League". Game Rant. Retrieved 9 November 2014. ^ Steve Jaws Jaworski (1 July 2014). "Announcing the North American Collegiate Championship". Riot Games. Retrieved 9 November 2014. ^ Emanuel Maiberg (8 February 2014). "Blizzard eSports initiative will support your college gaming club". Game Spot. Retrieved 9 November 2014. ^ Tassi, Paul. "Second US College Now Offering 'League of Legends' Scholarship". www.forbes.com. Retrieved 22 February 2015. ^ "Tespa to expand collegiate esports with $1 million in scholarships and prizes". ESPN.com. Retrieved 21 September 2017. ^ "List of varsity esports programs spans North America". ESPN.com. Retrieved 10 May 2018. ^ "Harrisburg University hosts international esports tryout". ESPN.com. Retrieved 14 May 2018. ^ "ESL to bring world class eSports to Japan with new local partner". 4 September 2014. Retrieved 9 November 2014. ^ Tassi, Paul. "ESPN Boss Declares eSports 'Not A Sport'". Forbes. Retrieved 15 December 2017. ^ "One World Championship, 32 million viewers". Retrieved 2 September 2015. ^ Magrino, Tom. "Welcome to the League of Legends 2014 World Championship!". Retrieved 20 August 2014. ^ Snider, Jake (26 July 2018). "What's Overwatch? Why is it on ESPN? 8 things to know about competitive gaming". Associated Press. Retrieved 29 July 2018 – via The Chicago Tribune. ^ Hill, Nathan (7 December 2017). "The Overwatch Videogame League Aims to Become the New NFL". Wired. Retrieved 7 December 2017. ^ Needleman, Sarah (9 February 2017). "NBA, Take-Two to Create Professional Videogame League". The Wall Street Journal. Retrieved 14 December 2017. ^ Sarkar, Samit (12 January 2018). "MLS launching esports league for FIFA 18 World Cup". Polygon. Retrieved 12 January 2018. ^ "eSports, sport or business?". Johan Cruyff Institute. Archived from the original on 18 September 2017. ^ Elsa (8 September 2011). "eSports: Really??". Destructoid. Retrieved 1 September 2013. ^ Tom Burns (26 July 2014). "'E-Sports' can now drop the 'e'". Al Jazeera. Retrieved 20 September 2015. ^ Schwartz, Nick (6 September 2014). "ESPN's president says that eSports are not 'real sports,' and he's wrong". USA Today. ^ Hillier, Brenna (8 September 2014). "ESPN boss says eSports are not "real sports"". VG247. ^ Reahard, Jef (8 September 2014). "ESPN boss: E-sports aren't sports". Engadget. ^ Tassi, Paul (7 September 2014). "ESPN Boss Declares eSports 'Not A Sport'". Forbes. ^ Gera, Emily (1 October 2014). "Does eSports need ESPN before the mainstream accepts it?". Polygon. ^ Emanuel Maiberg (6 September 2014). "ESPN Says eSports Isn't a Sport -- What Do You Think?". GameSpot. Retrieved 9 November 2014. ^ Sarkar, Samit. "HBO's 'Real Sports' debates the merits of eSports". Polygon. Retrieved 13 May 2015. ^ Graham, David Philip (12 December 2011). "Guest Editorial – Momentum Matters: A Historical Perspective on the FGC and eSports". Shoryuken.com. ^ "E-Sports and Other Games". World Mind Sports Federation. Archived from the original on 8 December 2015. Retrieved 23 August 2015. ^ Paresh Dave (7 August 2013). "Online game League of Legends star gets U.S. visa as pro athlete". LA Times. Retrieved 4 December 2013. ^ "P-1A Internationally Recognized Athlete". US Citizenship and Immigration Services. Retrieved 7 October 2013. ^ "Sizler de lisanslı E-Sporcu olabilirsiniz". Retrieved 17 January 2018. ^ "E-Spor Nedir?". Retrieved 17 January 2018. ^ "French government announces plans to legalize and regulate esports industry". VentureBeat. Retrieved 14 September 2016. ^ Sheldon, David (22 October 2017). "Philippines Officially Recognizes eSports As A Real Sport". Casino Org. Retrieved 22 October 2017. ^ Regalado, Pia (10 October 2017). "The Philippines' new athletes: eSports gamers". ABS-CBN News. Retrieved 22 October 2017. ^ Myers, Maddy (18 April 2017). "Esports Will Become A Medal Event At The 2022 Asian Games". Kotaku. Retrieved 18 April 2017. ^ a b c Wade, Stephen (1 September 2018). "Bach: No Olympic future for esports until 'violence' removed". Associated Press. Retrieved 3 September 2018. ^ Brown, Fraser (November 28, 2018). "Esports is an official medal event at the Southeast Asian Games". PC Gamer. Retrieved November 28, 2018. ^ Grohmann, Karolos (28 October 2017). "E-sports just got closer to being part of the Olympics". Reuters. Retrieved 5 November 2017. ^ Good, Owen (30 August 2017). "If esports come to the Olympics, don't expect to see 'violent' titles". Polygon. Retrieved 30 August 2017. ^ Orland, Kyle (13 March 2018). "Violent video games not welcome for Olympic esports consideration". Ars Technica. Retrieved 14 March 2018. ^ Frisk, Adam (19 July 2018). "Video gaming as an Olympic sport? IOC hosting eSports forum to better understand competitive gaming". Global News. Retrieved 20 July 2018. ^ Dominaco, Michael (20 July 2018). "Overwatch Players Involved In Talks With Olympic Committee To Discuss Esports Opportunities". IGN. Retrieved 20 July 2018. ^ Pham, Phuc (9 February 2018). "ESPORTS ZERG-RUSH THE OLYMPICS—BUT CAN THEY BECOME OFFICIAL EVENTS?". Wired. Retrieved 10 February 2018. ^ a b Nakamura, Yuri; Furikawa, Yuki (10 July 2018). "You Can Now Officially Play Esports for Money in Japan". Bloomberg L.P. Retrieved 13 July 2018. ^ Morris, Chris (10 December 2018). "Video Games Won't Be Part of the Paris Olympics". Fortune. Retrieved 10 December 2018. ^ robzacny (31 December 2012). "2012 in eSports: the battle for momentum between League of Legends, StarCraft 2, and Dota 2". PC Games N. Retrieved 15 November 2013. ^ Clark, Tim. "What I learned from playing with a professional Hearthstone coach". www.pcgamer.com. Retrieved 22 February 2015. ^ Michael McWhertor (4 March 2011). "The Sacrifices of StarCraft II Made In The Name of Sports". Kotaku. Retrieved 8 October 2013. ^ robzacny (24 October 2012). "How Riot Games are building a better League of Legends, and catching up to their own success". PC GamesN. Retrieved 8 October 2013. ^ Alan LaFleur (21 June 2012). "Valve show developers how to support eSports with Dota 2". Esports Business. Archived from the original on 22 December 2013. Retrieved 8 October 2013. ^ Steve Smith (15 August 2012). "Black Ops 2 CoDCaster System". Gamma Gamers. Archived from the original on 12 August 2014. Retrieved 28 June 2014. ^ Jeremy Peel (16 January 2013). "StarCraft 2's new observer UI mod tool should make for better eSports broadcasts". PC GamesN. Retrieved 3 November 2013. ^ Michael McWhertor (29 July 2013). "StarCraft 2 update adds new eSports features, color blind mode". Polygon. Retrieved 3 November 2013. ^ Tom Senior (17 August 2011). "Dota 2 tournament showcases Valve's e-sports spectator package". PC Gamer. Retrieved 3 November 2013. ^ Jordan Devore (10 November 2013). "The latest Counter-Strike: GO update is for spectators". Destructoid. Retrieved 3 November 2013. ^ "Spectator FAQ". Riot Games. Retrieved 22 January 2014. ^ Lucas Sullivan (17 June 2011). "The full breakdown on League of Legends' Spectator Mode". PC Gamer. Retrieved 3 November 2013. ^ Thursten, Chris. "Dota 2 Battle Pass update adds crazy new VR spectator mode". PC Gamer. Retrieved 9 August 2016. ^ Jason Schreier (20 June 2012). "Why StarCraft II Still Doesn't Support Local Multiplayer". Kotaku. Retrieved 7 September 2013. ^ Michael McWhertor (12 October 2012). "League of Legends LAN version in development at Riot Games, Mac client news coming". Polygon. Retrieved 7 September 2013. ^ Xairylle (20 September 2013). "DOTA 2 update: Why the LAN feature is something worth being excited about". TechInAsia. Retrieved 23 September 2013. ^ "GotFrag eSports - All Games News Story - TF2 Referees Wanted". Gotfrag.com. 10 October 2007. Archived from the original on 28 May 2012. Retrieved 4 June 2012. ^ Gloria Goodale (8 August 2003). "Are video games a sport?". CS Monitor. Retrieved 4 December 2013. ^ a b Andrew Goldfarb (1 May 2012). "League of Legends Season 2 Championship Announced". IGN. Retrieved 22 August 2012. ^ David Schmidt (16 July 2012). "NASL S3 Finals push SC2 earnings over $5m". ESFI World. Archived from the original on 12 December 2013. Retrieved 22 August 2012. ^ "Comparing the potential earnings of LCS PLayers to Professional Streamers". GAMURS. 27 October 2014. ^ "KeSPA Responds to KOCCA Pro Gamer Salary Data… 10 Players Over $85,241". LCK Translation Archive. 24 December 2015. Archived from the original on 6 April 2016. Retrieved 10 September 2016. ^ "The 2017-2018 Dota 2 Hub". ESPN. 26 August 2018. Retrieved 31 January 2019. ^ Ben Popper (30 September 2013). "Field of streams: how Twitch made video games a spectator sport". TheVerge. Retrieved 4 December 2013. ^ robzacny (21 August 2013). "LCS "a significant investment that we're not making money from", but Riot love it anyway". PCGamesN. Retrieved 14 September 2013. ^ Edge Staff (11 November 2010). "The battle for StarCraft II". Edge-Online. Retrieved 14 September 2013. ^ Simon "Go0g3n" (2009). "Blizzard VS. Kespa, the Ultimate fight". Gosu Gamers. Retrieved 18 September 2013. ^ Jeroen Amin (2 May 2012). "KeSPA, OGN, Blizzard and GOMtv Join Horses for StarCraft II". PikiGeek. Retrieved 14 September 2013. ^ "Tournament Guidelines Document" (PDF). Blizzard. 6 June 2013. Retrieved 14 September 2013. ^ "Prized Events". Riot. Retrieved 4 December 2013. ^ "Here's the insane training schedule of a 20-something professional gamer". Business Insider. Retrieved 5 April 2018. ^ "Inside an eSports training regimen". ESPN.com. Retrieved 5 April 2018. ^ "Inside compLexity, the esports team that's training alongside the Dallas Cowboys". qz.com. Retrieved 13 March 2019. ^ Brent Ruiz (3 February 2013). "Interview with Razer's global e-sports manager: The business behind sponsoring teams". ESFI World. Archived from the original on 22 August 2013. Retrieved 10 September 2013. ^ "Custom Esports Jerseys and Apparel". ^ "OpTic Gaming™ (@OpTicGaming) | Twitter". twitter.com. Retrieved 27 January 2016. ^ Soshnick, Scott (18 December 2015). "Former NBA Player Rick Fox Buys eSports Team Gravity". Bloomberg News. Retrieved 18 December 2015. ^ Van Allen, Eric. "Jeremy Lin endorses new Dota 2 team VGJ". ESPN. Retrieved 5 October 2016. ^ "Shaq, NRG Esports pick up Overwatch team". ESPN. ^ "Sources: Soccer org Schalke 04 finalizes League Championship Series roster, picks up Fox". espn.com. ^ Johnson, Jonathan (20 October 2016). "PSG unveil first three signings in ambitious eSports venture". ESPN. Retrieved 5 November 2016. ^ "Espor nedir? Bora Koçyiğit Fanatik'e anlattı!". Retrieved 17 January 2018. ^ David Daw (21 January 2012). "Web Jargon Origins Revealed". TechHive. Retrieved 22 September 2013. ^ Victor Meulendijks (8 February 2012). "IEM Sao Paolo: Manner Bear Conflict". Cadred. Archived from the original on 8 October 2013. Retrieved 8 October 2013. ^ "IWillDominate Tribunal Permaban & eSports Competition Ruling". 4 December 2012. Retrieved 9 November 2014. ^ Alexander Garfield (10 May 2013). "Evil Geniuses Releases Greg "IdrA" Fields". TeamLiquid. Retrieved 8 January 2014. ^ "League of Legends Pro Players Banned for "Toxic Behavior"". 3 June 2014. Retrieved 22 February 2015. ^ "Introducing Team Siren - YouTube". 30 May 2013. ^ "Why Team Siren Matters". 10 June 2013. Retrieved 27 December 2014. ^ "Siren broke up (with proof) - Page 16 - League of Legends Community". 19 June 2013. Retrieved 27 December 2014. ^ "League of Legends Team Siren Disbands: Valuable Lessons Learned - League of Legends". 26 June 2013. Retrieved 27 December 2014. ^ Jeremy Peel (27 August 2012). "League of Legends' Curse NA and Team Dignitas disqualified from MLG Summer Championship, no first or second place awarded". PC GamesN. Retrieved 22 September 2013. ^ Laura Parker (10 October 2012). "Riot fines League of Legends cheaters $30,000". GameSpot. Retrieved 22 September 2013. ^ Sun_tzu (21 June 2013). "Solo out of Rox.KIS". joinDota. Retrieved 3 July 2014. ^ "Valve Bans Pro Counter-Strike Teams For Match Fixing". GameSpot. Retrieved 2 September 2015. ^ "Valve tackles Counter Strike gambling sites". BBC. 21 July 2016. Retrieved 21 July 2016. ^ a b c d Parkin, Simon (8 April 2015). "Winners might use drugs". Eurogamer. Retrieved 19 July 2015. ^ a b c Hodson, Hal (18 August 2014). "Esports: Doping is rampant, industry insider claims". New Scientist. Retrieved 19 July 2015. ^ a b Summers, Nick (17 July 2015). "Top 'Counter-Strike' player admits eSports has a doping problem". Engadget. Retrieved 19 July 2015. ^ Franzen, Bjoern (14 August 2014). "Doping in eSports – The almost invisible Elephant in the room". BjoernFranzen.com. Retrieved 19 July 2015. ^ Stout, Hilary (19 May 2015). "Selling the Young on 'Gaming Fuel'". The New York Times. Retrieved 19 July 2015. ^ "ESL Major Series One Rulebook" (PDF). Electronic Sports League. Retrieved 19 July 2015. ^ Frank 'Riot Mirhi' Fields (5 November 2014). "KOREA'S PRO EXODUS MAY SPELL BAD NEWS FOR THE GAME'S TOP REGION". Riot Games. Retrieved 9 November 2014. ^ Owen S. Good (18 March 2014). "Top Korean League of Legends player fixed matches before attempting suicide, says eSports league". Polygon. Retrieved 9 November 2014. ^ Travis Gafford (27 October 2014). "Major changes heading to Korea for the 2015 season". OnGamers. Retrieved 9 November 2014. ^ Luke Winkie (31 May 2016) The eSports Injury Crisis Vocativ, Retrieved 3 June 2016. ^ Caymus (11 November 2014). "Official 2015 Season LoL eSports League Reform Plan Announced (Final Version)". News of Legends. Archived from the original on 18 May 2015. Retrieved 28 April 2015. ^ "Dota 2 is the richest of the big esports, but its players are the poorest". The Daily Dot. 13 August 2014. Archived from the original on 18 May 2015. Retrieved 2 May 2015. ^ Gaudiosi, John (28 October 2015). "Global esports revenues are nearing 2 billion". Fortune. Retrieved 9 November 2015. ^ Wolf, Jacob (2 June 2017). "Nevada governor approves esports betting bill". ESPN. Retrieved 8 June 2018. ^ Jones, Ali (17 May 2018). "Esports betting may soon become legal in several American states". PCGamesN. Retrieved 8 June 2018. ^ Myers, Maddy (8 June 2018). "New Jersey Added A Last-Minute Esports Betting Ban And No One Knows Why". Kotaku. Retrieved 8 June 2018. ^ "Win Prediction in Esports: Mixed-Rank Match Prediction in Multi-player Online Battle Arena Games" (PDF). 17 November 2017. Retrieved 12 August 2018. ^ "'DOTA analytics': Big data meets e-sports in software giant deal with Team Liquid". ABC-CBN News. 10 May 2018. Retrieved 12 August 2018. ^ Shah, Saqid (December 14, 2018). "Blizzard cancels 'Heroes of the Storm' eSports plans". Engadget. Retrieved December 16, 2018. ^ McWhertor, Michael (December 14, 2018). "Heroes of the Storm pros vent sadness, anger after Blizzard kills game's esports future". Polygon. Retrieved December 16, 2018. ^ Dave, Paresh. "ESPN.com to cover e-sports with same 'rigor' as it does the big leagues". LA Times. Retrieved 13 July 2016. ^ "Yahoo Launches New Experience Dedicated to Esports". Yahoo. Retrieved 13 July 2016. ^ Tracey Lien (16 July 2013). "How two StarCraft commentators became stars". Polygon. Retrieved 11 September 2013. ^ Justin Binkowski (25 March 2017). "Goodbye eSports: The 2017 AP Style Guide will settle the esports spelling debate once and for all". Dot Esports. ^ Taylor Cocke (24 March 2017). "It's official: The AP Style guide spells it 'esports', not 'eSports', 'e-sports', or 'Esports'". Yahoo Esports. ^ Nunnelley, Stephany (September 18, 2018). "Fortnite streamer Ninja graces cover of latest ESPN magazine – a first for professional gaming". VG247. Retrieved September 18, 2018. ^ Jon Partridge (29 October 2014). "How Hitbox plans to take on Twitch". RedBull. Retrieved 29 October 2014. ^ Erik Cloutier (29 January 2013). "Own3D is Shutting Down. Twitch TV Declared Winner". GamingSoul. Retrieved 1 July 2013. ^ "Dreamhack and Twitch.TV Announce Record-Breaking Online Viewership". Dreamhack. ^ Paul Tassi (2 May 2013). "Talking Livestreams, eSports and the Future of Entertainment with Twitch". Forbes. Retrieved 16 September 2013. ^ "MLG Streaming Platform". Major League Gaming. Retrieved 28 July 2014. ^ "1376% Growth in MLG.tv Viewership in Q1". Major League Gaming. 10 April 2014. Retrieved 28 June 2013. ^ "MLG Championship 2014 - Anaheim, CA". Esports Maxl. 22 June 2014. Archived from the original on 27 June 2014. Retrieved 28 June 2013. ^ "Video Game Super Star "Nadeshot" Signs Exclusive Deal with Major League Gaming". Major League Gaming. 10 April 2014. Retrieved 28 June 2013. ^ a b "Activision Buys Major League Gaming to Broaden Role in E-Sports". The New York Times. Retrieved 5 January 2016. ^ Lewis, Richard (24 March 2015). "YouTube to relaunch livestreaming service with focus on esports and gaming". The Daily Dot. Archived from the original on 14 April 2015. Retrieved 4 May 2015. ^ a b "The International Dota 2 championships will be watchable on ESPN3". Polygon. 17 July 2014. Retrieved 21 July 2014. ^ "League of Legends' maker inks rich broadcast contract, with an eye on premium content". Polygon. Vox Media. Retrieved 18 December 2016. ^ "'League of Legends' E-Sports Contests Lure Newest Fan: Major League Baseball". Wall Street Journal. Retrieved 18 December 2016. ^ Daniel Tack (4 September 2013). "Riot Games, 'League of Legends', And The Future Of eSports". Forbes. Retrieved 8 October 2013. ^ Radoslav "Nydra" Kolev (25 September 2013). "DreamHack partners with MTG for eSports studio in Stockholm". Gosu Gamers. Retrieved 12 November 2013. ^ Molina, Brett. "Blizzard unveils "Heroes of the Storm" tournament". USA Today. Retrieved 24 January 2016. ^ Marks, Tom (27 April 2015). "Heroes of the Dorm finals were a success story for esports". PCGamer. Retrieved 4 May 2015. ^ Wynne, Jared (18 February 2015). "Esports are coming to television in Norway". The Daily Dot. Archived from the original on 14 April 2015. Retrieved 7 April 2015. ^ "Riot Games and Big Ten Network partner for televised Ohio State vs. Michigan State League of Legends match". SB Nation. Retrieved 18 April 2016. ^ Jones, Ali (18 August 2017). "The company that governs TV ratings just started an esports organisation". PCGamesN. Retrieved 18 August 2017. ^ "Overwatch League comes to ESPN, Disney and ABC". ESPN. 11 July 2018. Retrieved 11 July 2018. Wikimedia Commons has media related to Electronic sports. This page was last edited on 2 April 2019, at 04:01 (UTC).